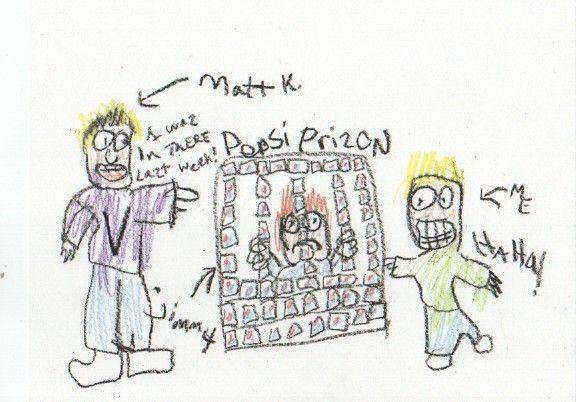 Welcome to the Timmy and the Pepsi Prison story! Old skooler's know this, I guess half the fun will be lost to the people who weren't around VBB, and the devs way back when that was. Many thanks go to Plasma for this. Today we went on a field trip. We went to a computer place called Volition. I sat next to Jimmy Morgan on the bus. Jimmy is really stupid, but there were no other seats to sit in. Jimmy always talked about how his dad works with computers and how he's so great. I guess his dad programs in something called COLBALT - I don't know what that is, but my dad said the day COLBALT programmers get paid as much as C++ programmers will be the day hell freezes over. There were a lot of corn fields but we got there okay. The building was brown and had a lot of windows. 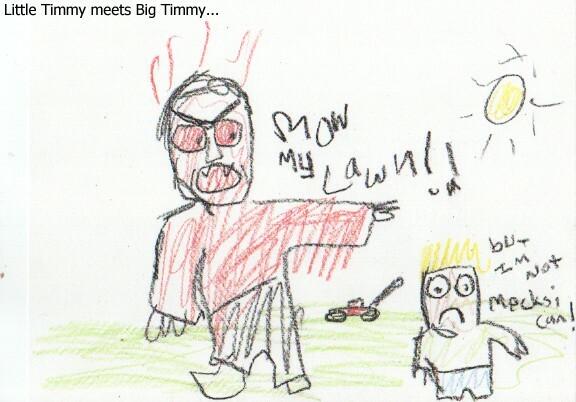 Jimmy was talking about how his dad works in a better building, but Jimmy is stupid so I pushed him into some bushes. When we got inside we sat in the lobby for a few minutes and then the teacher led us to one of the Volition people's offices. The guy there was named Dave and he was a programmer. He was dressed like a pirate, too! There were a lot of pop cans all over Dave's place. I like pop, and so does Dave, so I guess he's pretty cool. He was showing us some of the games he helped make but that dummy Jimmy kept inturrupting and saying his dad was better and how his dad had a bigger office and how his dad knows some people at Microsoft. Jimmy kept yelling like that then he took one of Pirate Dave's Pepsis. 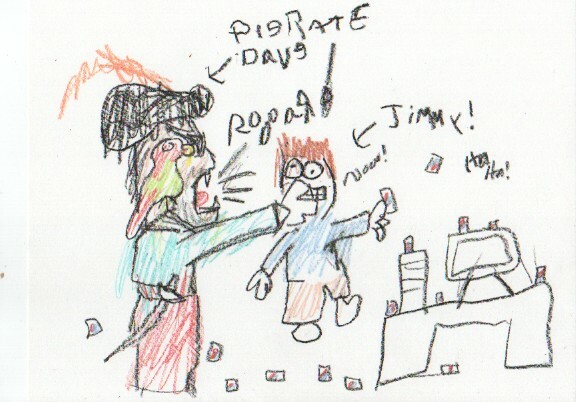 Pirate Dave got upset and grabbed Jimmy and yelled, "To Pepsi Prison with you, scurvy sea urchin!". Jimmy is stupid. Jimmy went into Pepsi Prison which was this fort thing made out of pop cans. It was really cool. Me and my friend Jacob always tried to make forts but they were never very good. Pirate Dave showed me how to build a fort out of pop cans like Pepsi Prison. There was a guy named Matt there, too. He laughed at Jimmy like the rest of us did. He said Pepsi Prison was mostly used to hold employees who act bad. 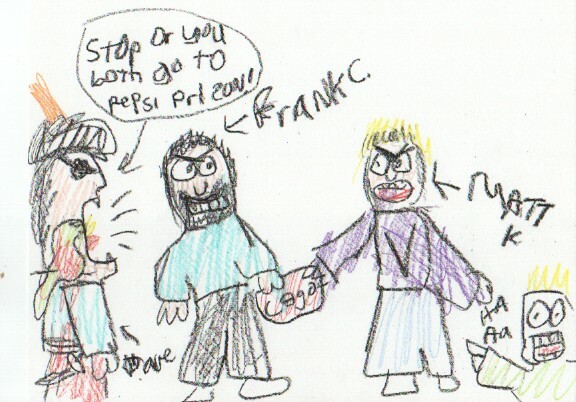 He said he was in Pepsi Prison last week for fighting with another employee named Frank over a toy firetruck. Matt asked the class if they wanted to play with Legos. Legos are cool so a lot of us said 'Yes'. We all made spaceships and played with them; but Matt cheated and used all the good Lego pieces so he won. But then Frank came and said he wanted the Legos because they were his. After Matt and Frank got locked away in Pepsi Prison we went to another office. Nate was in the office and he liked Pokemon. He even said that his name was Nathanachu because some dummy procrastinator on the internet made up that name for him. We argued over which Pokemon was the best. Nate said Psyduck was the best, but we all know that Jigglypuff is the best Pokemon around! We traded Pokemon cards for a while. Nate said he really wanted to see the new Pokemon movie. I don't know where Jimmy went. Then we went to Mike Kulas' office. He talked in weird phrases and had a box in his hand that he wouldn't let go of. The box said "Excel" on it. When I asked Mike what the box was for he said, "What box? That's my hand. We must create a new initiative to shift our technology paradigm to be more conclusively interactive!". Jimmy was in his office, too. I don't know how he got out of Pepsi Prison, but he started saying that his dad had a better office and had a better box in his hand. 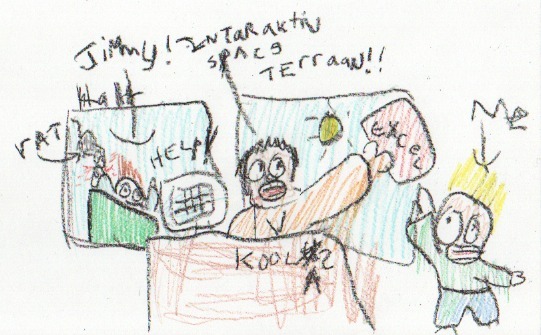 Jimmy wouldn't shut up about it until Mike called in John Slagel (Mike called him Pig Farmer for some reason) and told him to take Jimmy to the "Time Out" box. 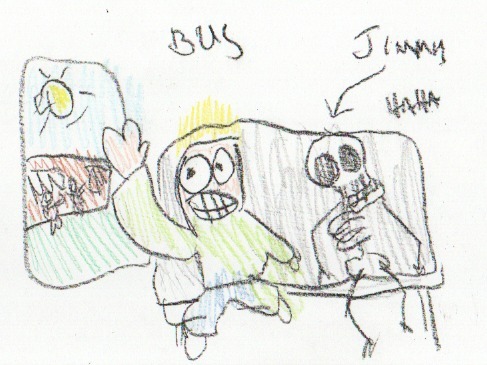 John took Jimmy and threw him into the dumpster outside. Ha ha! Jimmy is stupid! Mike Kulas kept talking but then we got distracted by Jimmy screaming about the rats eating him. Jimmy is stupid. Then our class went around and talked to some artists (Except Jimmy. He's stupid.). Adam Pletcher kept talking in weird terms like Mike Kulas did. He talked to us on how easy he thought we'd be to "polymodel". He wouldn't talk to me because I'd require too many "alpha filters". Tim Borrelli said he'd give a quarter to whoever would go mow his lawn so he wouldn't have to. When we all said "No" he told us to go away. Then it was 1:00 and the teacher said we had to go. So we said goodbye to all the Volition people. We even went to the Pepsi Prison to say goodbye to Matt Kresge and Frank (They were fighting over which transformer is better). On the bus I had to sit next to Jimmy again, but this time he was quiet. Maybe the rats made it so he couldn't talk. Ha ha! Jimmy is stupid! 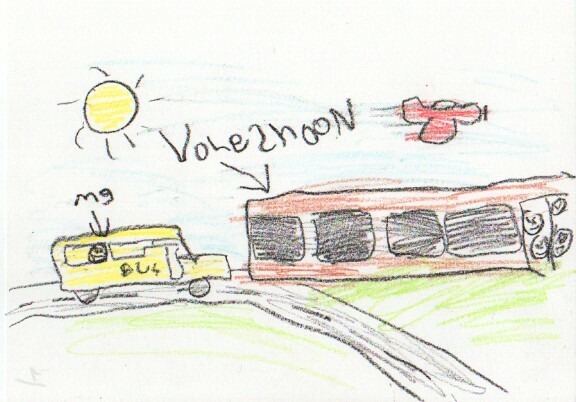 I learned that being a software maker can be fun. Maybe someday I can go to work at Volition and prove to Nathan that Psyduck isn't good.